The Johns Hopkins Center for Communication Programs (CCP) led the Health Communication Component (HCC) of USAID’s Maternal and Child Health (MCH) Program in Pakistan. HCC worked with the Lady Health Worker Programme (LHWP) to promote primary health care in Sindh Province. In Sindh, some 22,500 Lady Health Workers (LHWs) serve a population of 23 million people, playing a vital role in the community and in improving health-seeking behaviors. LHWs serve as the primary liaison between the formal health system and the community, serving about 150-200 households each. Despite their important role, LHWs face several challenges that have potential to impact their performance. Studies have shown that while LHWs have sufficient technical knowledge regarding MCH practices, their ability to effectively transfer this knowledge to their target audience needs improvements – especially among married women of reproductive age and their families. Specifically, HCC found that LHWs often had inadequate resources and job aids which negatively impacted their ability to communicate effectively with community members. This was especially pertinent to the topic of family planning. Further, studies suggested that communicating family planning information with their clients was commonly perceived by LHWs to be a difficult activity. Consequently, HCC recognized a gap: LHWs required capacity strengthening to strengthen interpersonal communication (IPC) skills and enhance their job performance. To address the needs of the Lady Health Workers, HCC's strategy was to develop materials, both paper-based and mobile app-based, that would help them build their capacity and skills. The toolkit would be designed to improve the communication skills and interpersonal effectiveness of LHWs as they provided Reproductive, Maternal, Newborn and Child Health (RMNCH) counseling services to clients. This paper-based toolkit would later be adapted to become a mobile health tool. The original paper-based IPC Toolkit, Roshan Mustaqbil, was designed through a consultative process and incorporated a three-step problem-solving technique. Suggest action points for positive behavioral activation. The paper version of Roshan Mustaqbil is delivered through a set of counseling cards which the LHW uses as a job aid during her visits to married women. All the counseling cards have illustrations that tell the story of families that have poor health outcomes because of their thoughts and resultant behaviors, and positively deviant families that are doing better because of their healthy thinking and practices, even though they are living in the same community or context. The discussion around these stories helps the mother identify behaviors that need improvement in her context and small steps that can be taken to improve these behaviors. The original toolkit covered 22 health topics. 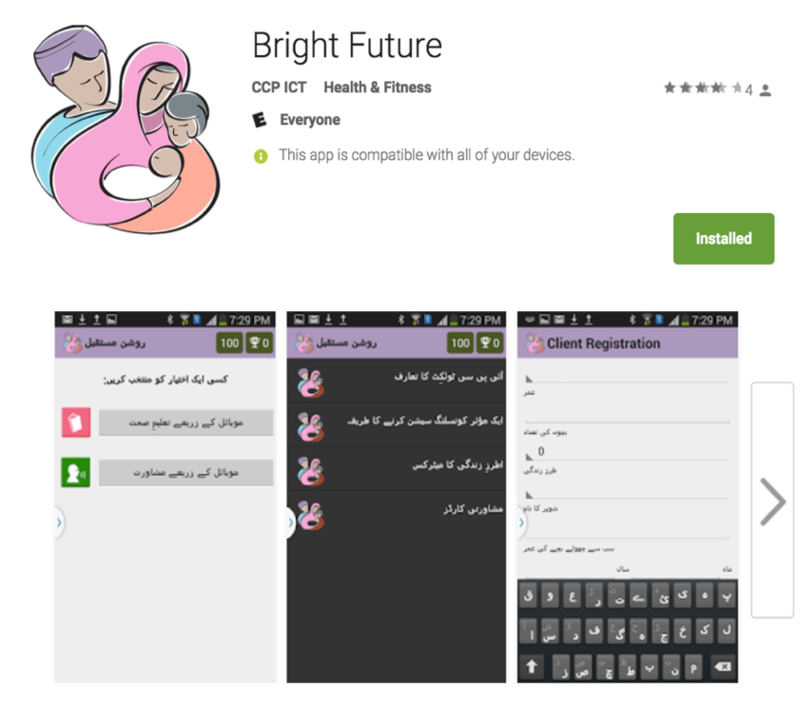 After the successful launch of the paper-based Roshan Mustaqbil (Bright Future) IPC Toolkit in 2015, HCC set out to develop an innovative mHealth application designed to build on the strengths of the LHW job description and workflow. The first mobile application of its kind for LHWs, Roshan Mustaqbil was designed to meet the LHWs educational needs as adult learnings while also empowering them to better engage and respond to the RMNCH needs of their communities. To develop the application, HCC conducted a series of workshops with key stakeholders, including representatives from the Lady Health Worker Programme, Department of Health government, non-government organizations, UN agencies and development partners. Each of the two components of the app was developed separately given the differences in objectives. In 2016, to design and develop the mCounseling component, the HCC held a 10-day design period to assess LHWs’ existing workflows, specific capacity development needs and aptitude for the technology. The approach focused on meeting both the basic functional needs of the technology (i.e. Android based) and user requirements (i.e. limited text, entertaining content). In 2016/ 2017, the mLearning component of the App was developed during a two-day design workshop. This workshop allowed for a deeper understanding of the existing LHW training curriculum and the current practices of LHWs. This information was used to develop adult learning theory-based IPC content that highlighted key skills necessary for effective counseling during the three-step IPC approach. In addition, LHWs highlighted small group meetings as a potential area of growth. As a result, HCC developed additional content to provide guidance for counseling small groups (vs. one-on-one household counseling). Later in 2017, a series of educational videos placed on the mLearning part of Roshan Mustaqbil app to highlight the skills necessary for effective Interpersonal Communication (IPC). The videos demonstrate important aspects of IPC Lady Health Workers should practice to improve their IPC skills. In this way, the videos are desinged to help increase knowledge related to IPC Skills (including CCP’s 3 step counseling process and supplementary IPC skills) while building confidence and motivation to conduct household visits and small group discussions (Community Support Groups - CSG, Village Health Committees - VHC). OppiaMobile, the technology supporting Roshan Mustaqbil, is an open source mobile learning platform integrated with the Learning Management System known as “Moodle”. The core OppiaMobile functionality allows for systematic delivery, reliable access to content and easy management of health promotion content, video and quizzes. The initial deployment onto Android based tablets or phones can either occur over Wi-Fi, computer cable connection or via Bluetooth. Once loaded onto the Android smartphone, this content can be accessed offline and used when no internet connection is available. If and when a connection becomes available usage data, such as quiz scores, are sent back to the server for near real-time monitoring by program managers. In addition, frontline health workers (FLHWs) can earn points and badges within the App by completing App activities. The points, together with the usage statistics, provide regular feedback illustrating how the App is being used by the FLHW. These analytics are posted and stored on a dynamic dashboard which helps to improve programmatic decision-making. Working from an Android-based application format, the App was built on the OppiaMobile platform, which has now been validated as a solution for multiple CCP country teams (e.g. India, Nigeria, Nepal, and Pakistan) as it is able to deliver content to achieve both educational and counseling objectives to frontline workers. The Roshan Mustaqbil Application for Pakistan added value to the existing platform in that it was designed to a serve a dual purpose: mLearning (self-learning) and mCounseling (client counseling) on maternal and child health. mCounseling (digitized version of the Roshan Mustaqbil IPC Toolkit) combines the three-step IPC approach (Listen, Understand, Jointly Problem Solve) endorsed by the LHW Programme, with interactive audiovisual materials on maternal child health. The self-learning component applied adult learning theories to develop a learning pathway for Pakistani Lady Health Workers. Through mLearning, LHWs also benefit from engaging entertainment-education videos, quizzes and other educational resources designed to encourage introspection and skills-building. The application contains over 60 short films, 10 quizzes and other specialized content developed to engage Lady Health Workers through the self-learning and counseling process. Incorporates key elements of the initial paper-based Roshan Mustaqbil IPC toolkit developed by HCC, including three step counseling, motivational messaging, positive deviance, etc. LHWs are trained to use the engaging and educational resources to stimulate conversation. mCounseling contains 44 short entertainment-education videos that reflect positive and negative FP/ MNCH behaviors on 22 technical contents. mCounseling content enables the LHWs to enhance her community-based health education services in a more effective way by presenting technical health content in an engaging format. A self-learning tool that provides opportunities for refresher trainings for LHWs to supplement existing training activities. Content focuses on enhancing the IPC skills of LHWs, and improving the knowledge of community-based workers. Content builds on previous IPC trainings and acts as a next level training by presenting advanced components of the IPC toolkit, including effective IPC and small group facilitation. Applies adult learning theories (Gagne) to assist LHWs with IPC and counseling skills. Contains quizzes and text-based sections which are used to highlight key IPC skills each LHW can practice with clients. HCC piloted both the mCounseling and mLearning components and conducted assessments to gauge the technical functionality, perceived usefulness, perceived effectiveness on role, and performance of the application. 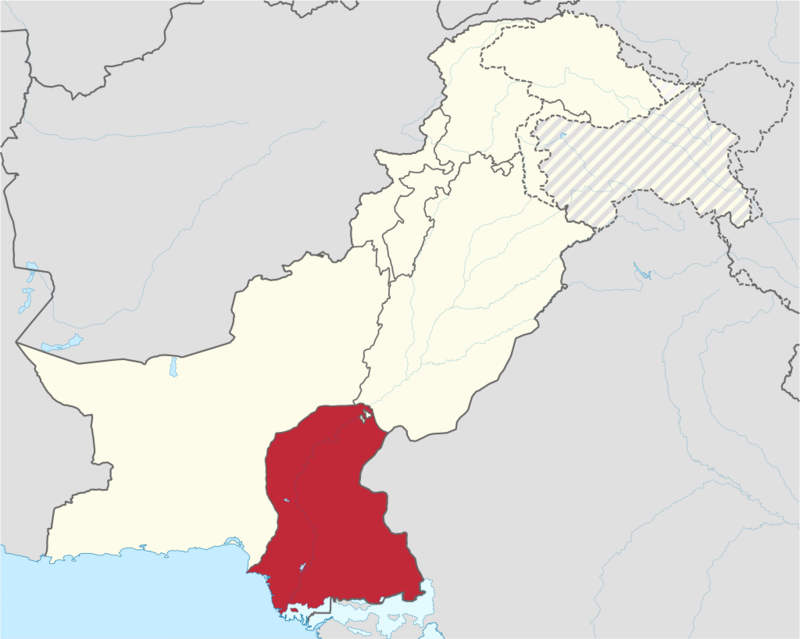 The evaluation design used to evaluate the trial of the mLearning and mCounseling components of Roshan Mustaqbil was a cross-sectional prospective panel of LHWs residing in communities in Matiari District in Sindh Province. The sample size included 58 LHWs who were selected on the basis of overlap in their coverage areas. Results from field testing of both the mLearning and mCounseling components showed that a rural sample of community-based health workers, many of whom had basic education skills, were capable of easily using the App effectively to deliver quality services to clients. Users perceived that using both components of the App enhanced their knowledge, skills, and overall role performance. By the end of the mCounseling trial, all the participants agreed that their overall effectiveness as a LHW was enhanced from the resource. Specifically, with the use of Roshan Mustaqbil, LHWs perceived improvements in the way they performed their tasks, namely their ability to work faster, provide comprehensive information, and interact easily with clients. The App usage was not perceived to change what the LHWs were capable of doing, but was perceived to influence their confidence as well as how fast, productive, and efficient they were in completing their work. HCC recommended that the Sindh government and Sindh Lady Health Worker Programme in Pakistan continue to invest in proven methods of LHW capacity building, such as the newly developed mHealth application.